Showing clients that you're making them money is one of the most important things you can communicate to them, but it's tough to know how to present your results in a way they can easily understand. That's where Google Data Studio comes in. In this week's edition of Whiteboard Friday, our friend Dana DiTomaso shares how to create a client-friendly local marketing results dashboard in Google Data Studio from start to finish. Hi, Moz fans. My name is Dana DiTomaso. I'm President and partner of Kick Point. We're a digital marketing agency way up in the frozen north of Edmonton, Alberta. We work with a lot of local businesses, both in Edmonton and around the world, and small local businesses usually have the same questions when it comes to reporting. 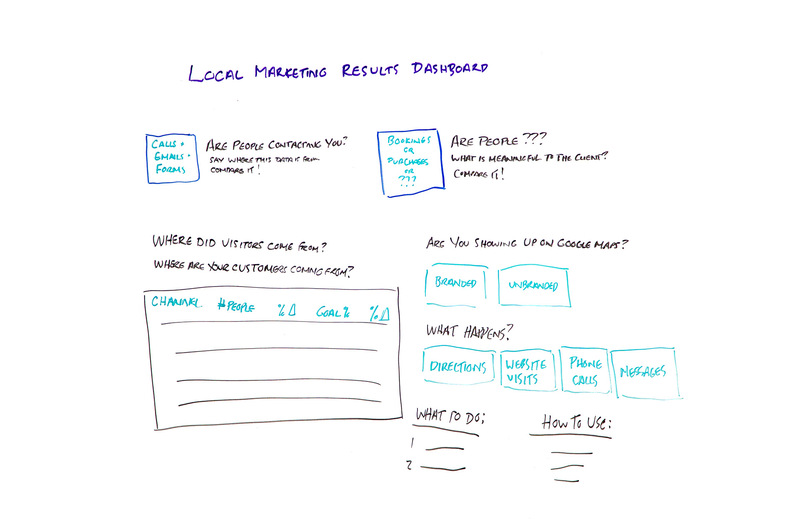 What I'm going to share with you today is our local marketing dashboard that we share with clients. We build this in Google Data Studio because we love Google Data Studio. If you haven't watched my Whiteboard Friday yet on how to do formulas in Google Data Studio, I recommend you hit Pause right now, go back and watch that, and then come back to this because I am going to talk about what happened there a little bit in this video. This is a Google Data Studio dashboard which I've tried to represent in the medium of whiteboard as best as I could. Picture it being a little bit better design than my left-handedness can represent on a whiteboard, but you get the idea. Every local business wants to know, "Are we making money?" This is the big thing that people care about, and really every business cares about making money. Even charities, for example: money is important obviously because that's what keeps the lights on, but there's also perhaps a mission that they have. But they still want to know: Are people filling out our donation form? Are people contacting us? These are important things for every business, organization, not-for-profit, whatever to understand and know. What we've tried to do in this dashboard is really boil it down to the absolute basics, one thing you can look at, see a couple of data points, know whether things are good or things are bad. Let's start with this up here. The first thing is: Are people contacting you? Now you can break this out into separate columns. You can do phone calls and emails for example. Some of our clients prefer that. Some clients just want one mashed up number. So we'll take the number of calls that people are getting. If you're using a call tracking tool, such as CallRail, you can import this in here. Emails, for example, or forms, just add it all together and then you have one single number of the number of times people contacted you. Usually this is a way bigger number than people think it is, which is also kind of cool. Are people taking the action you want them to take? The next thing is: Are people doing the thing that you want them to do? This is really going to decide on what's meaningful to the client. For example, if you have a client, again thinking about a charity, how many people filled out your donation form, your online donation form? For a psychologist client of ours, how many people booked an appointment? For a client of ours who offers property management, how many people booked a viewing of a property? What is the thing you want them to do? If they have online e-commerce, for example, then maybe this is how many sales did you have. Maybe this will be two different things — people walking into the store versus sales. We've also represented in this field if a person has a people counter in their store, then we would pull that people counter data into here. Usually we can get the people counter data in a Google sheet and then we can pull it into Data Studio. It's not the prettiest thing in the world, but it certainly represents all their data in one place, which is really the whole point of why we do these dashboards. Where did visitors com from, and where are your customers coming from? People contacting you, people doing the thing you want them to do, those are the two major metrics. Then we do have a little bit deeper further down. On this side here we start with: Where did visitors come from, and where are your customers coming from? Because they're really two different things, right? Not every visitor to the website is going to become a customer. We all know that. 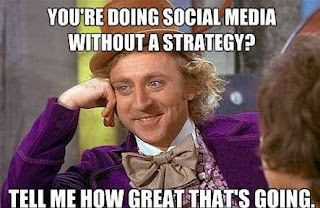 No one has a 100% conversion rate, and if you do, you should just retire. We really need to differentiate between the two. In this case we're looking at channel, and there probably is a better word for channel. We're always trying to think about, "What would clients call this?" But I feel like clients are kind of aware of the word "channel" and that's how they're getting there. But then the next column, by default this would be called users or sessions. Both of those are kind of cruddy. You can rename fields in Data Studio, and we can call this the number of people, for example, because that's what it is. Then you would use the users as the metric, and you would just call it number of people instead of users, because personally I hate the word "users." It really boils down the humanity of a person to a user metric. Users are terrible. Call them people or visitors at least. Then unfortunately, in Data Studio, when you do a comparison field, you cannot rename and call it comparison. It does this nice percentage delta, which I hate. It's just like a programmer clearly came up with this. But for now, we have to deal with it. Although by the time this video comes out, maybe it will be something better, and then I can go back and correct myself in the comments. But for now it's percentage delta. Then goal percentage and then again delta. They can sort by any of these columns in Data Studio, and it's real live data. Put a time period on this, and people can pick whatever time period they want and then they can look at this data as much as they want, which is delightful. If you're not delivering great results, it may be a little terrifying for you, but really you shouldn't be hiding that anyway, right? Like if things aren't going well, be honest about it. That's another talk for another time. But start with this kind of chart. Then on the other side, are you showing up on Google Maps? We use the Supermetrics Google My Business plug-in to grab this kind of information. We hook it into the customer's Google Maps account. Then we're looking at branded searches and unbranded searches and how many times they came up in the map pack. Usually we'll have a little explanation here. This is how many times you came up in the map pack and search results as well as Google Maps searches, because it's all mashed in together. Then what happens when they find you? So number of direction requests, number of website visits, number of phone calls. Now the tricky thing is phone calls here may be captured in phone calls here. You may not want to add these two pieces of data or just keep this off on its own separately, depending upon how your setup is. You could be using a tracking number, for example, in your Google My Business listing and that therefore would be captured up here. Really just try to be honest about where that data comes from instead of double counting. You don't want to have that happen. The last thing is if a client has messages set up, then you can pull that message information as well. Then at the very bottom of the report we have a couple of columns, and usually this is a longer chart and this is shorter, so we have room down here to do this. Obviously, my drawing skills are not as good as as aligning things in Data Studio, so forgive me. But we tell them what to do. Usually when we work with local clients, they can't necessarily afford a monthly retainer to do stuff for clients forever. Instead, we tell them, "Here's what you have to do this month.Here's what you have to do next month. Hey, did you remember you're supposed to be blogging?" That sort of thing. Just put it in here, because clients are looking at results, but they often forget the things that may get them those results. This is a really nice reminder of if you're not happy with these numbers, maybe you should do these things. Then the next thing is how to use. This is a good reference because if they only open it say once every couple months, they probably have forgotten how to do the stuff in this report or even things like up at the top make sure to set the time period for example. This is a good reminder of how to do that as well. Because the report is totally editable by you at any time, you can always go in and change stuff later, and because the client can view the report at any time, they have a dashboard that is extremely useful to them and they don't need to bug you every single time they want to see a report. It saves you time and money. It saves them time and money. Everybody is happy. Everybody is saving money. I really recommend setting up a really simple dashboard like this for your clients, and I bet you they'll be impressed.